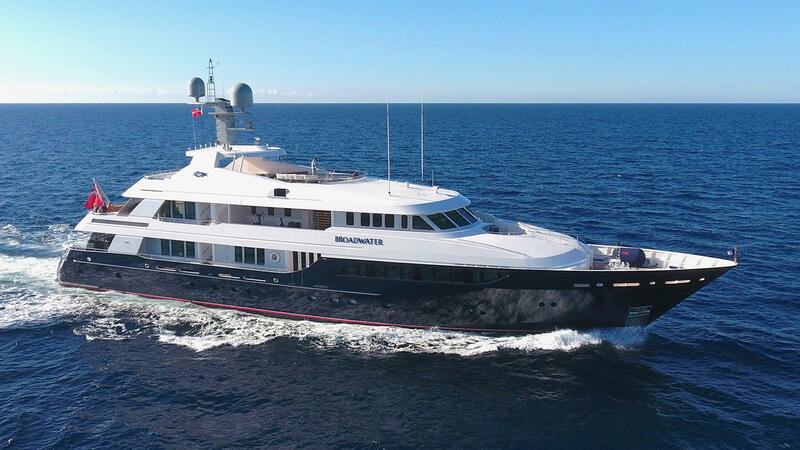 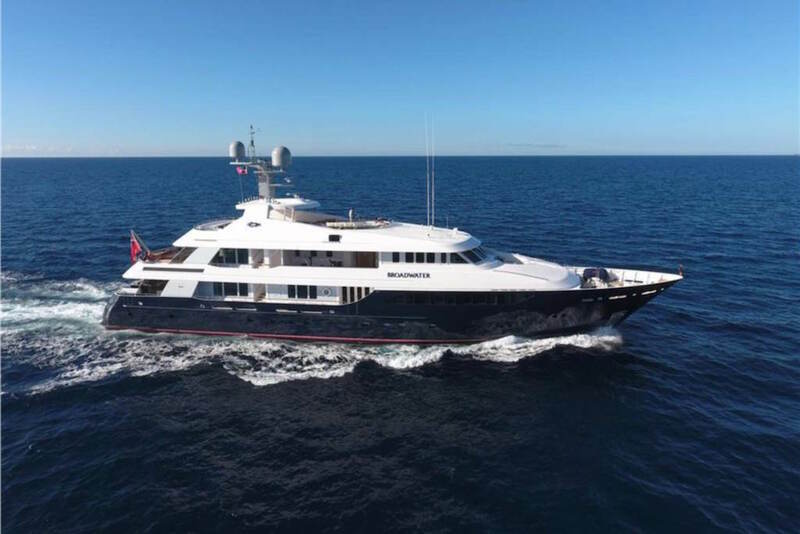 Motor yacht BROADWATER (ex Deja Va, Blue Moon, Blue Moon II, Sweet Pea) is a 50.40m (165') Feadship superyacht launched in 2000 by the Royal van Lent Shipyard. 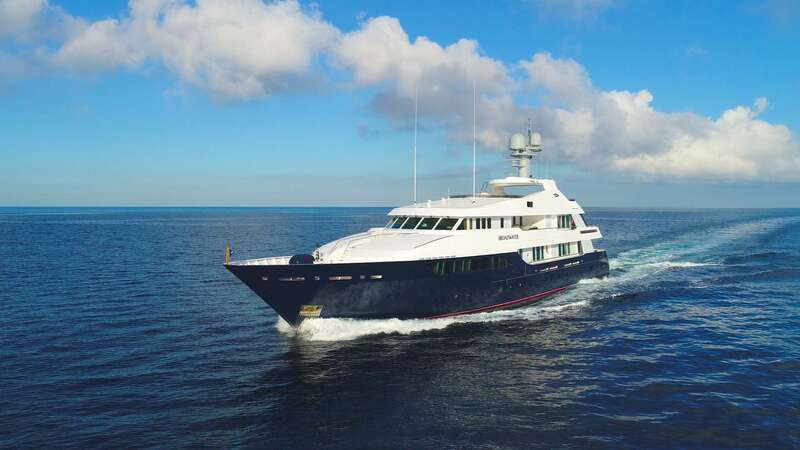 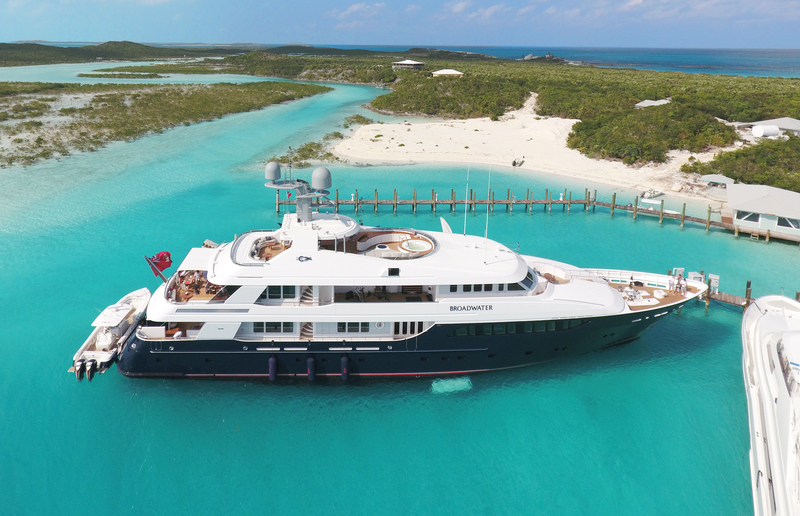 She was refitted in 2017 and offers accommodation in 6 luxurious cabins, for up to 12 charter guests. 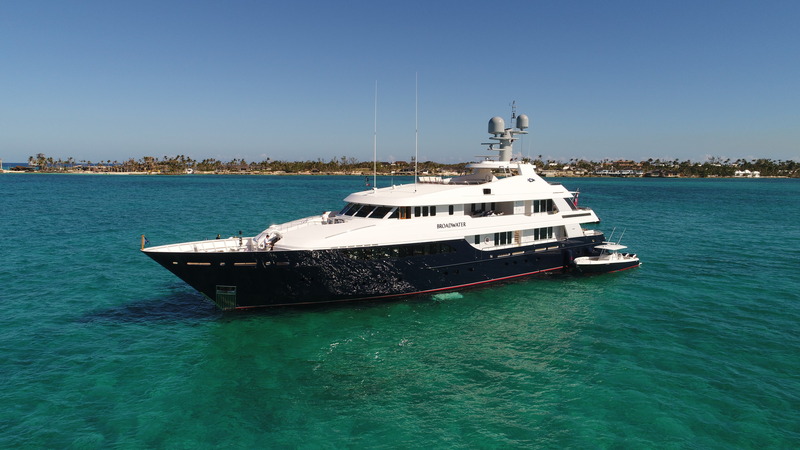 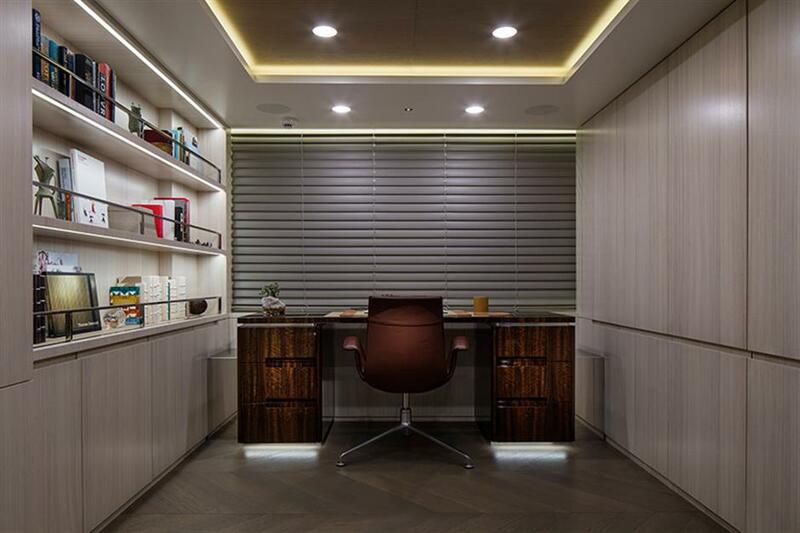 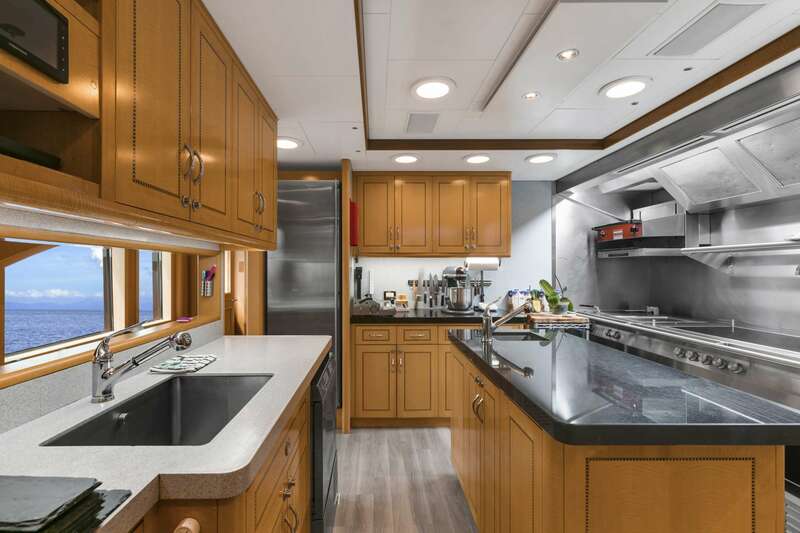 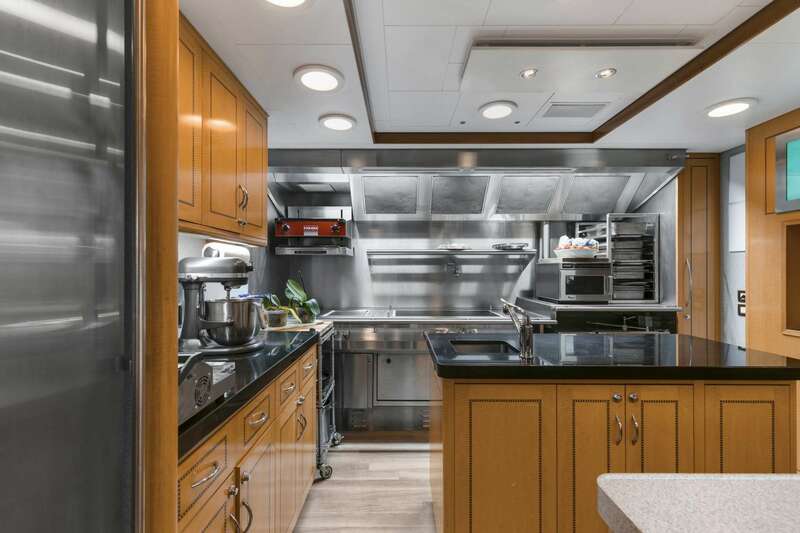 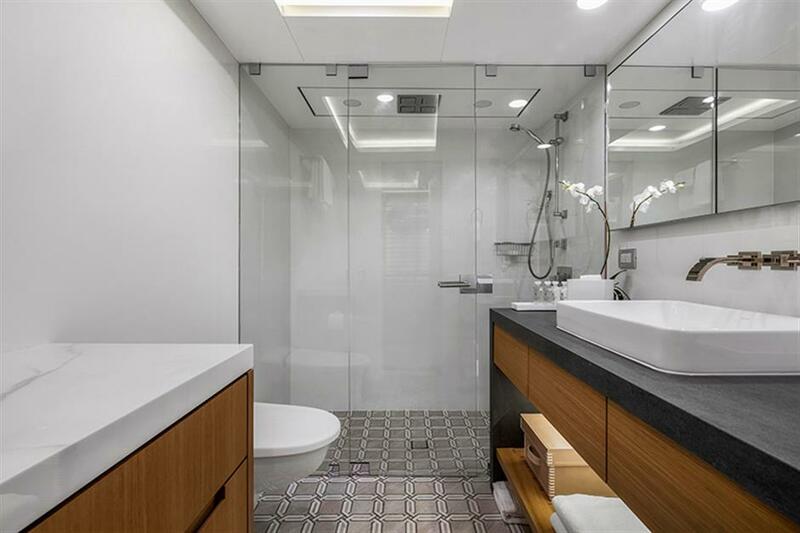 Her interior refit was by award-winning Adam Voorhes. 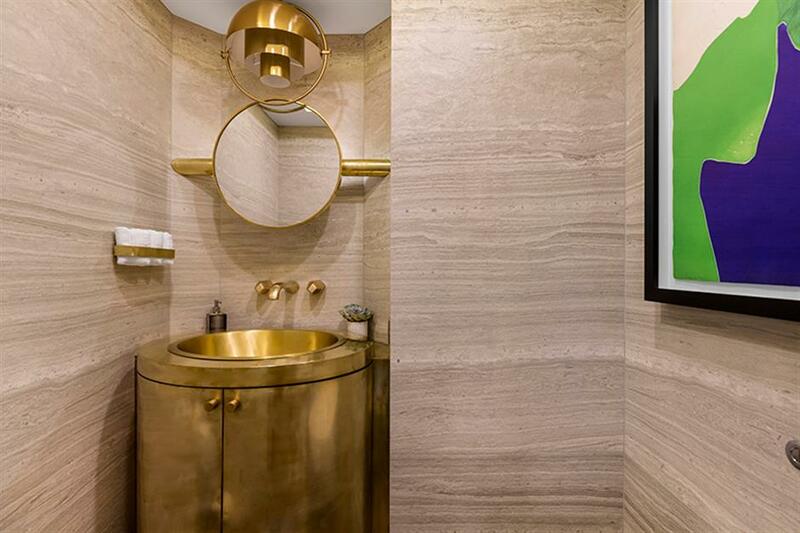 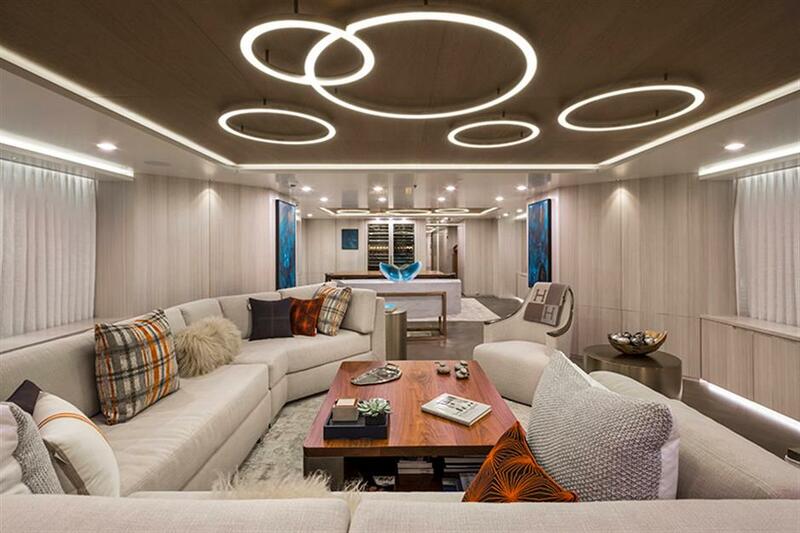 The décor is contemporary and elegant, featuring chic furnishings, bespoke custom finishes and fine arts throughout. 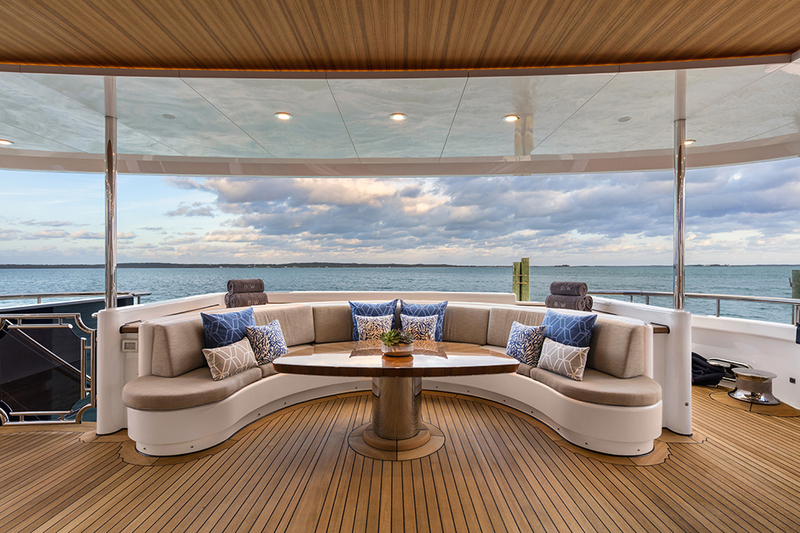 The main salon offers a large uniquely shaped sofa, occasional chairs, coffee table and entertainment. 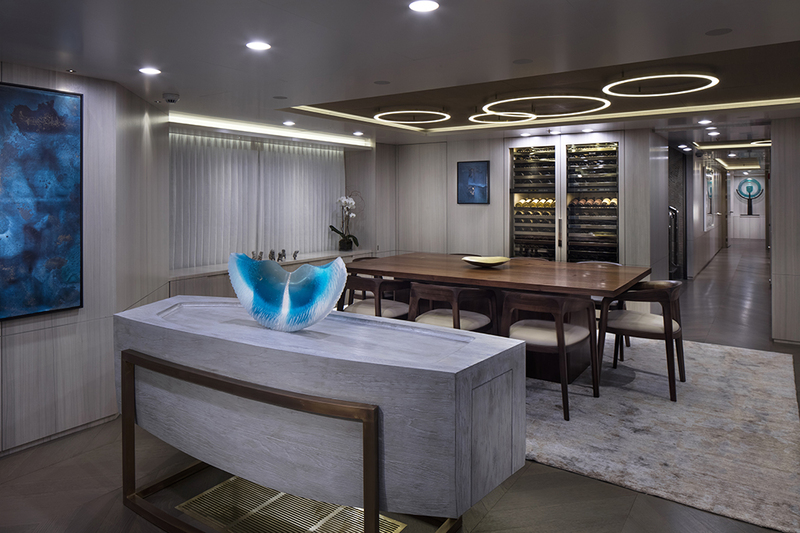 Forward of the salon in an open plan layout is the formal dining table, along with custom built extensive wine cooler. 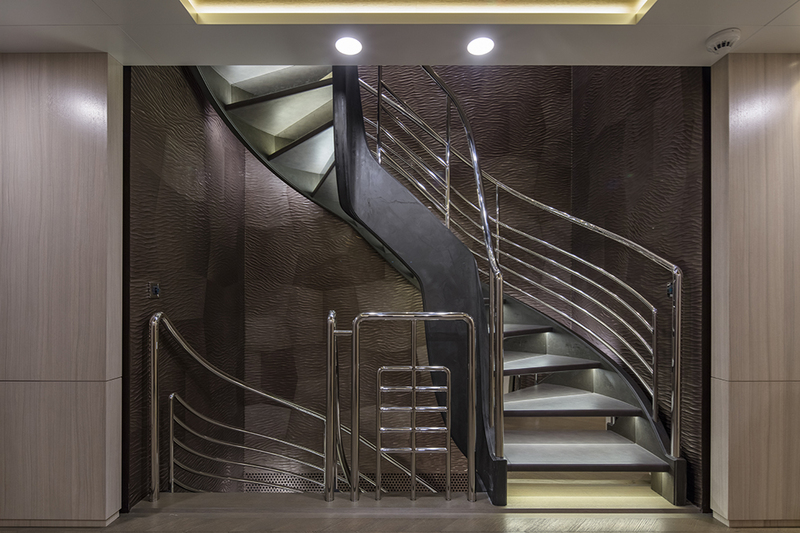 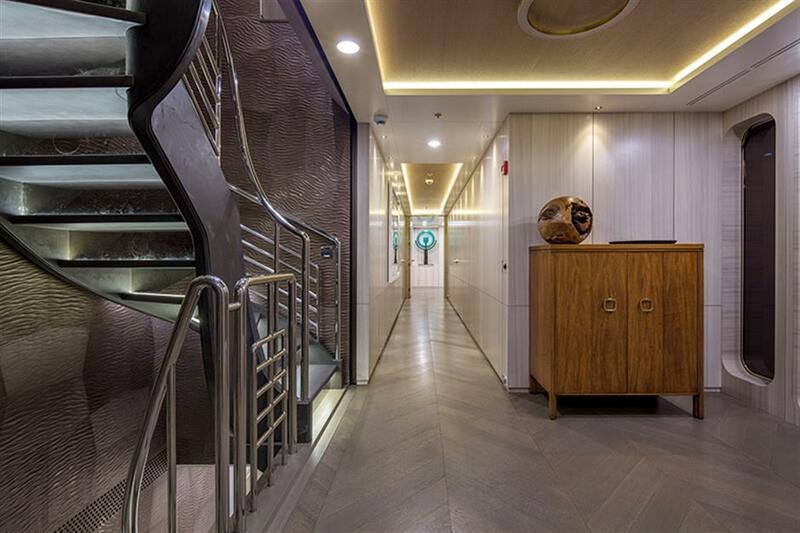 On the starboard side, a foyer leads to the guest day head and main entrance. 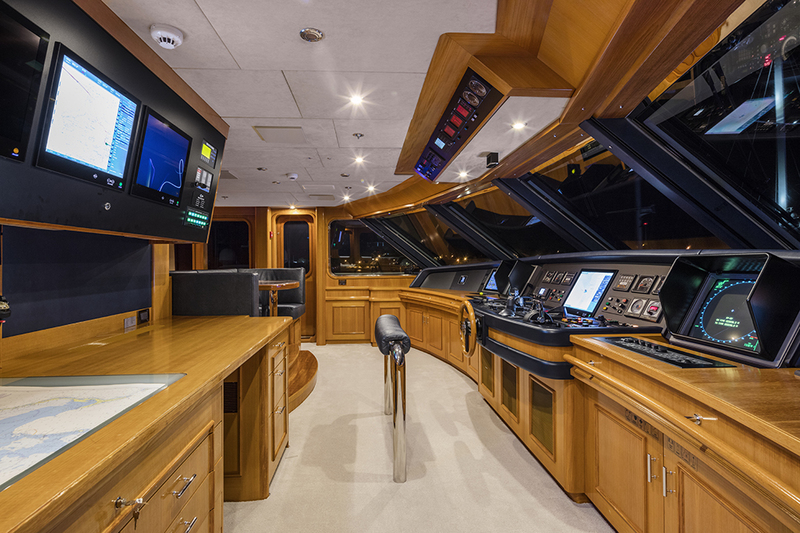 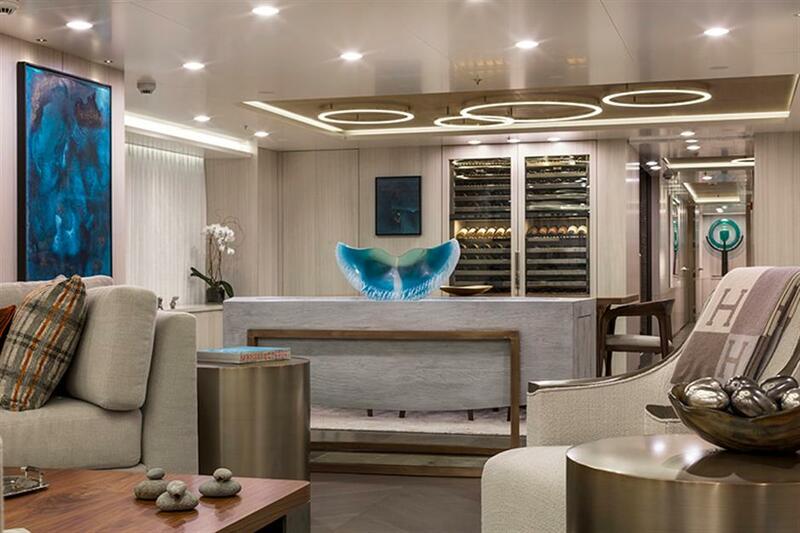 Her VIP cabin is on the main deck starboard side, followed by the full beam master stateroom on the main deck forward. 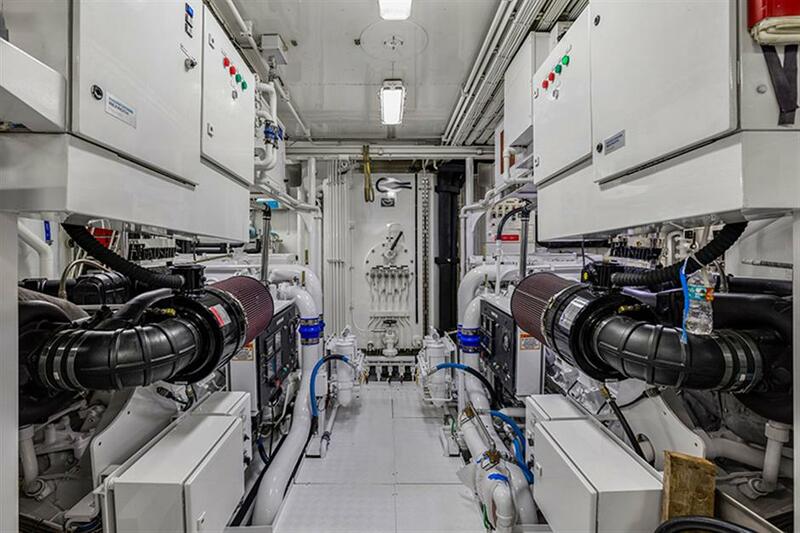 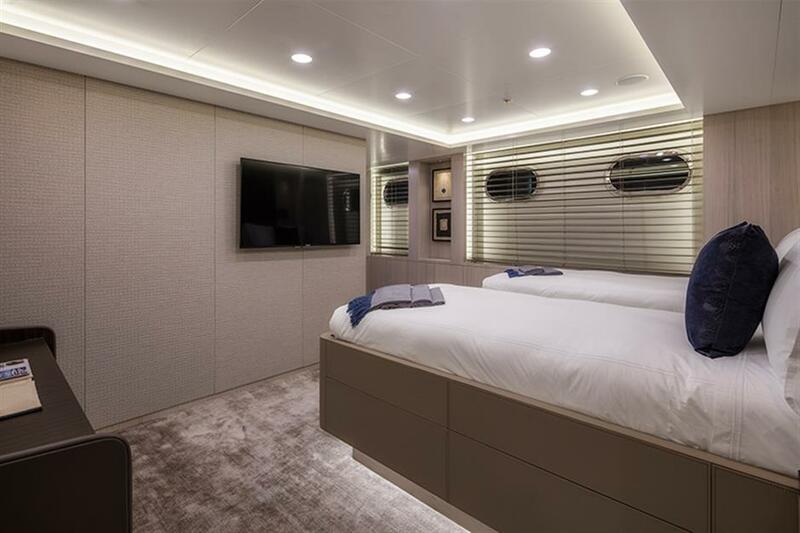 Additional accommodation is below decks, in 4 ensuite cabins. 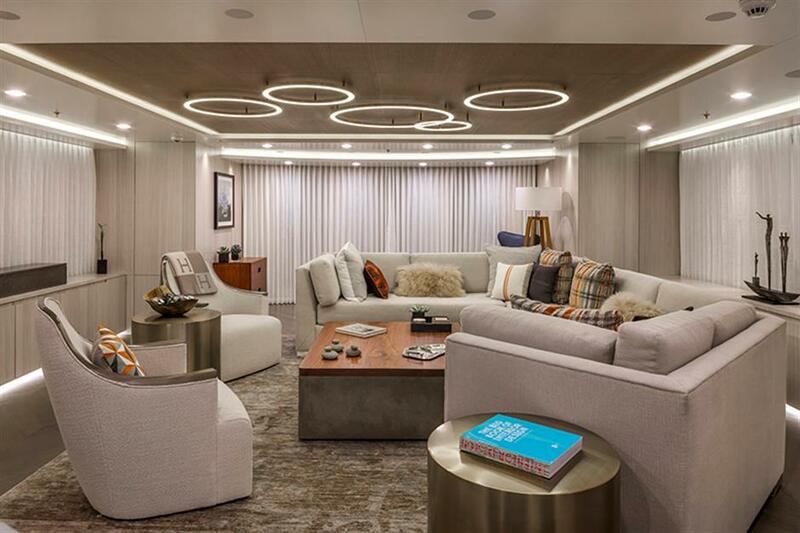 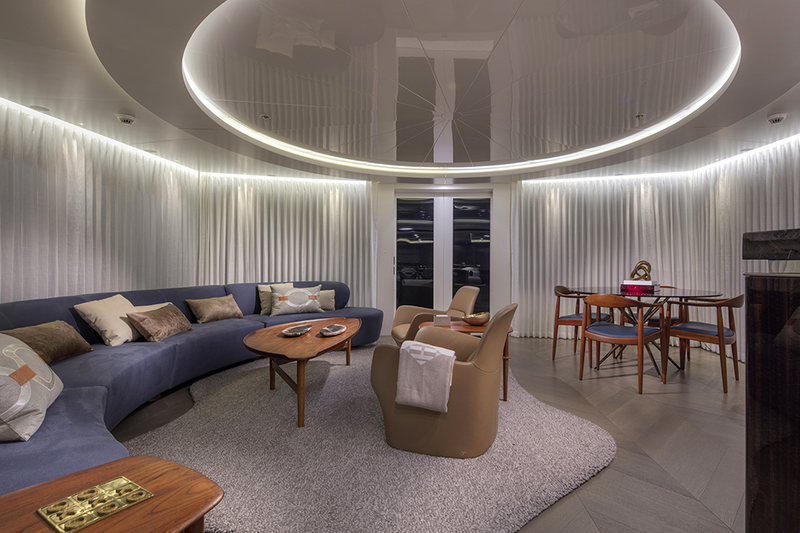 The upper sky lounge is perfect for relaxing and entertaining, offering a crescent-shaped sofa, coffee table, games table and wet bar. 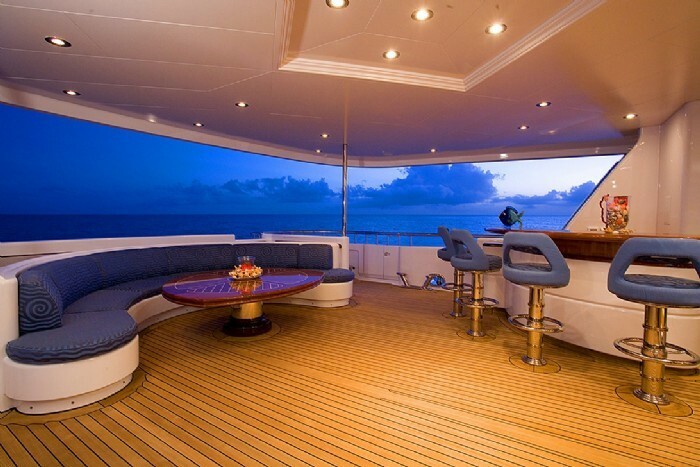 A day head is also available on the upper deck. 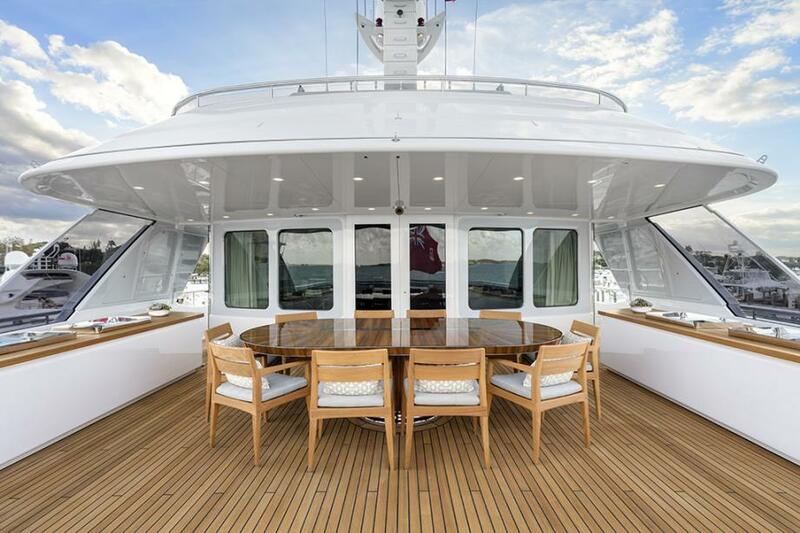 Exterior space is plentiful over three well-appointed and functional decks. 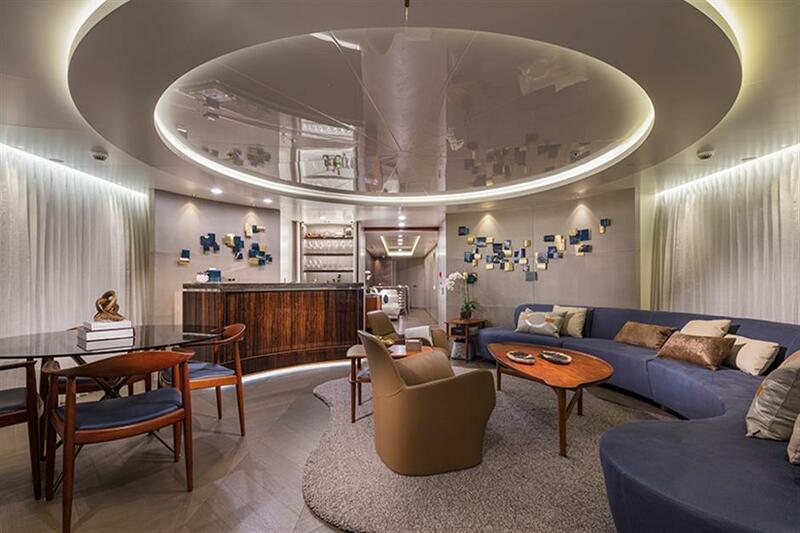 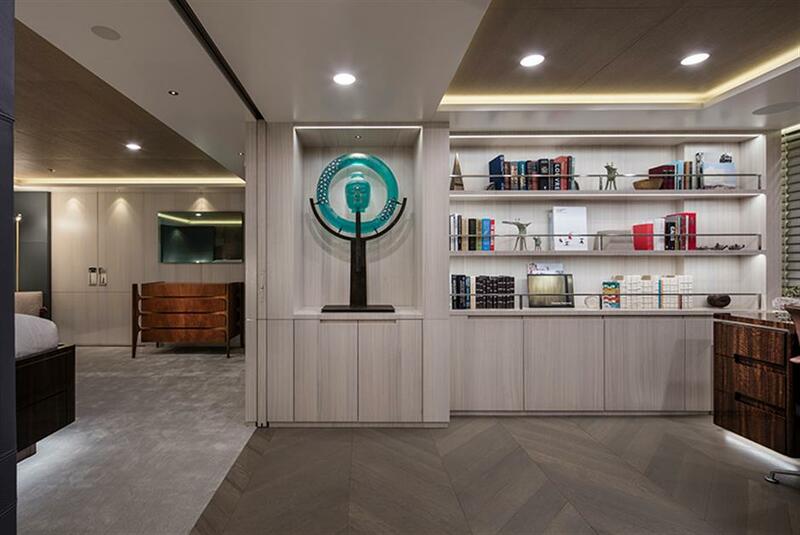 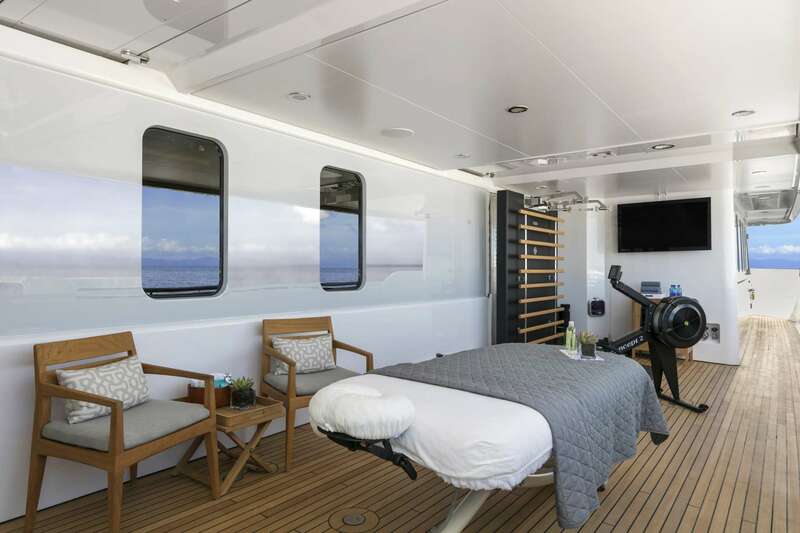 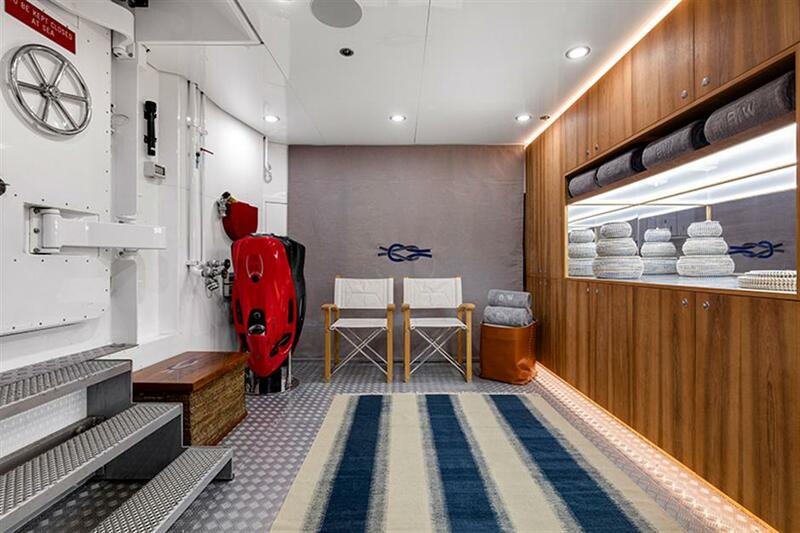 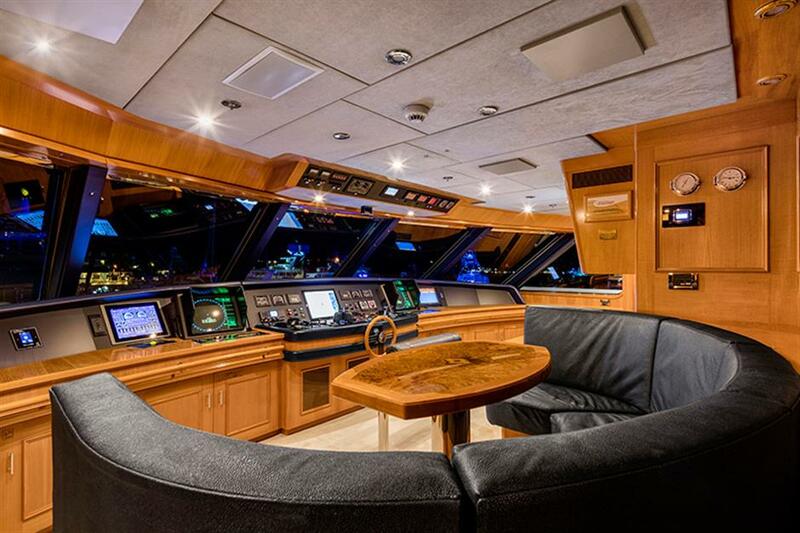 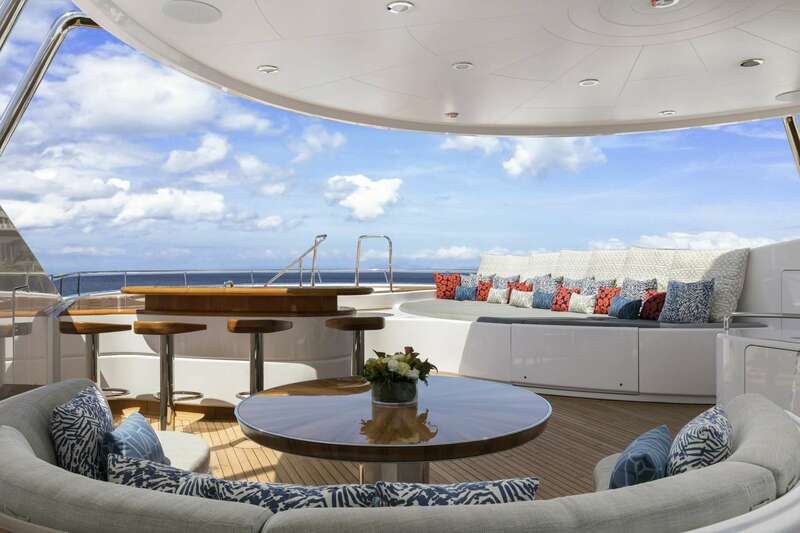 The main salon opens out onto the shaded aft deck, with comfortable seating, TV entertainment, and a wet bar. 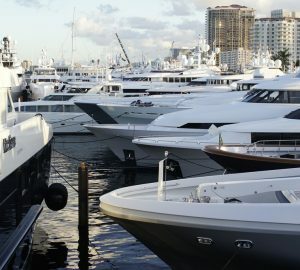 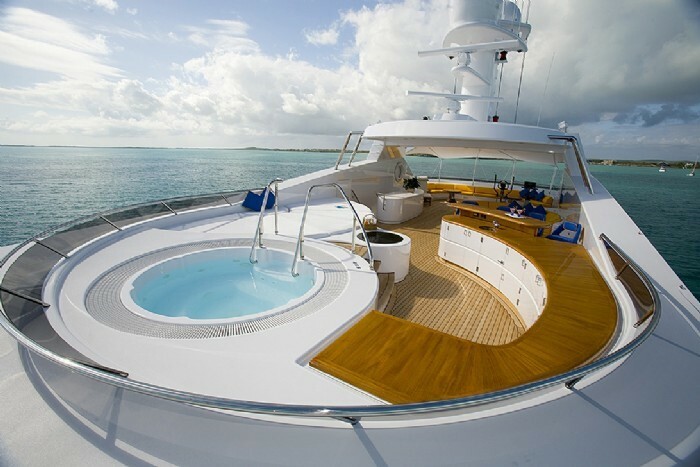 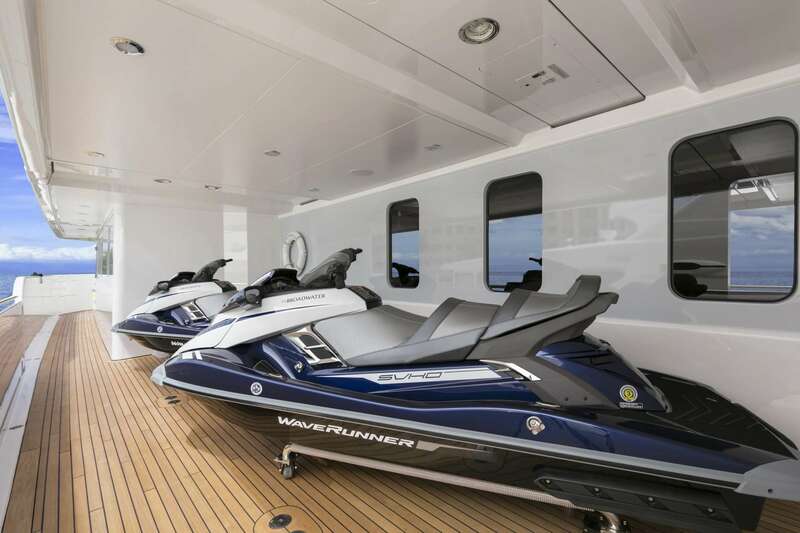 Further aft, the extended swim platform ensures the water enthusiasts can enjoy the great assortment of toys on offer. 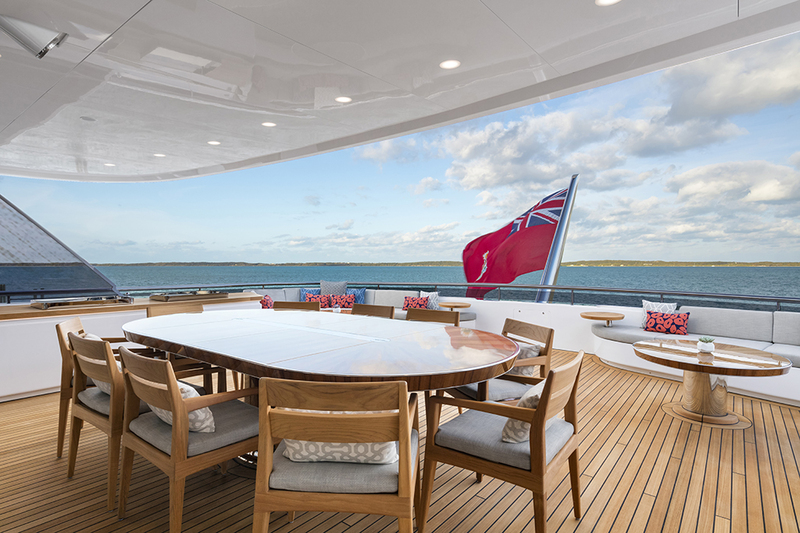 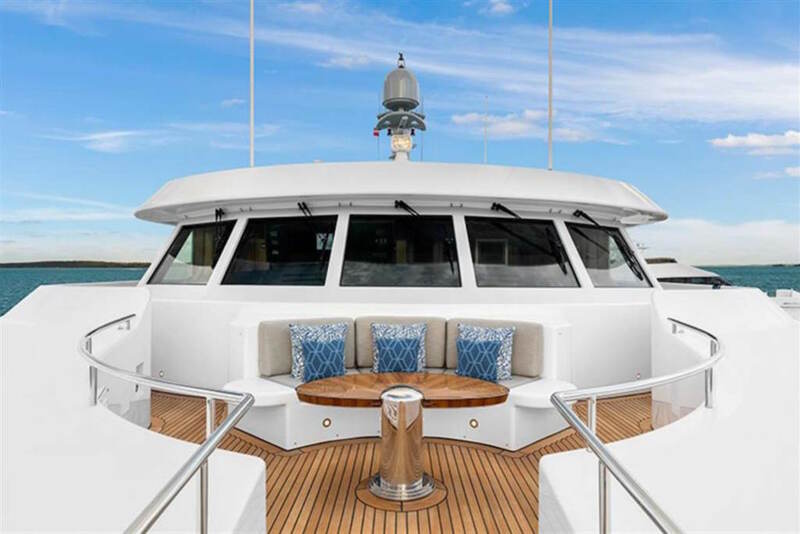 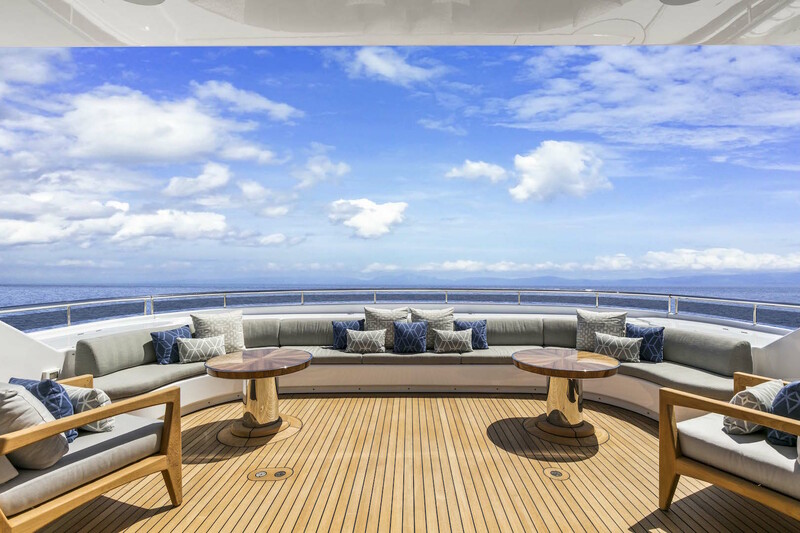 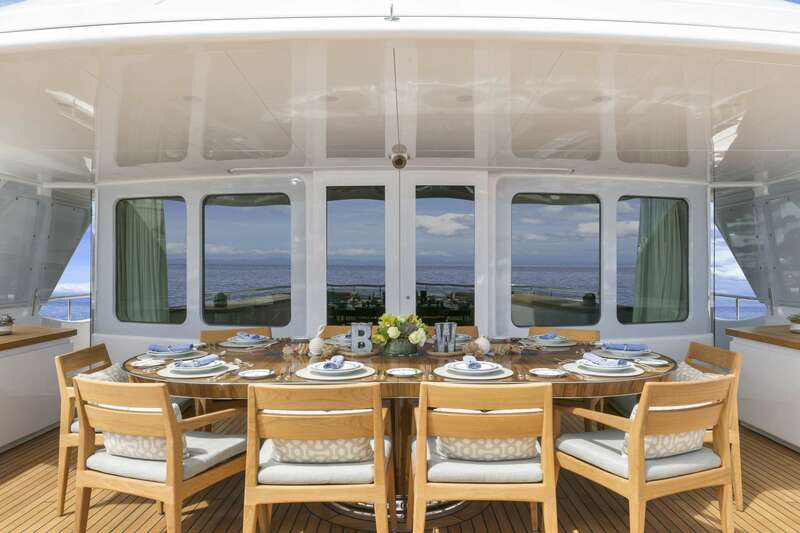 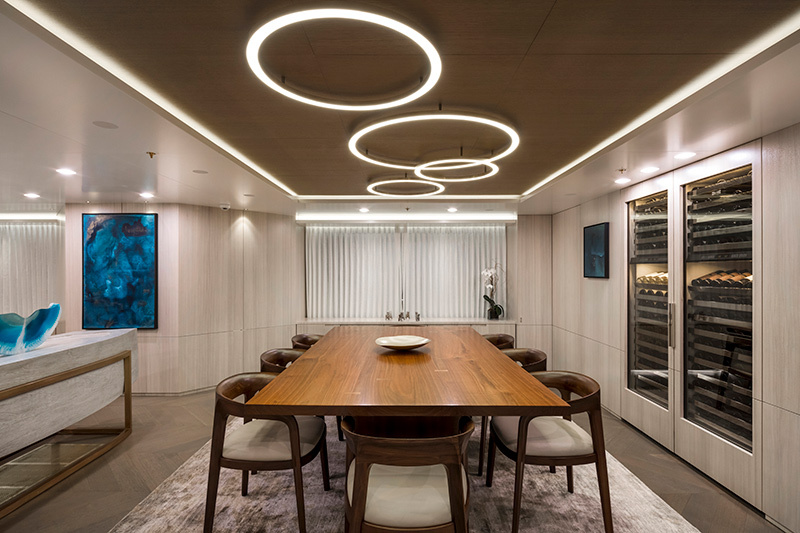 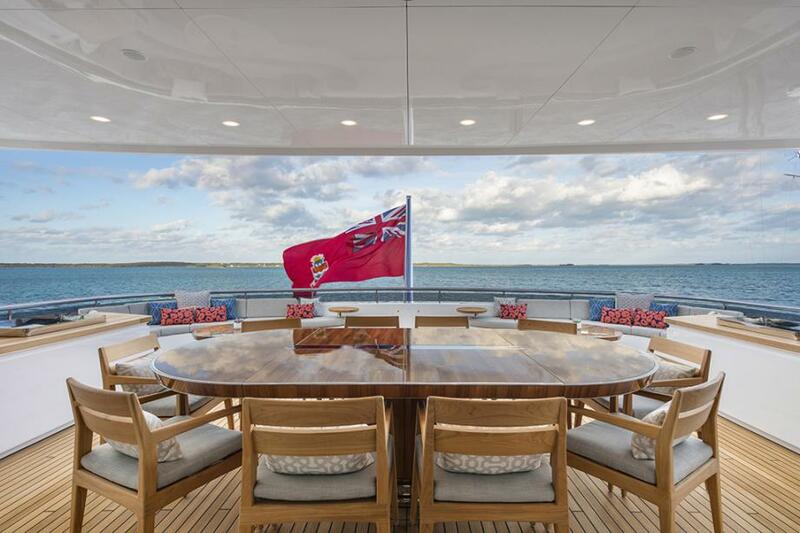 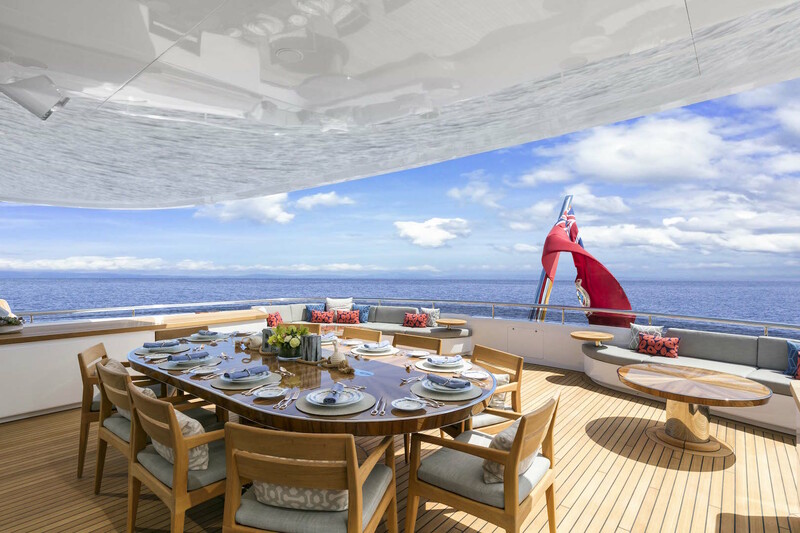 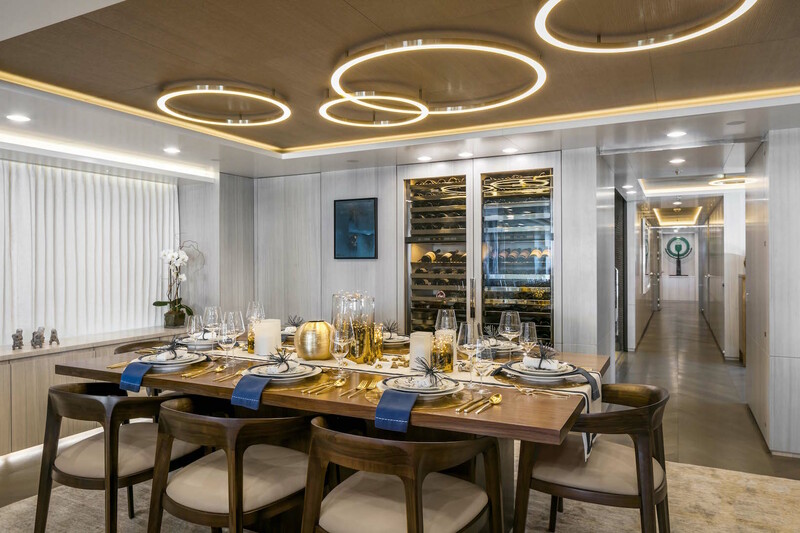 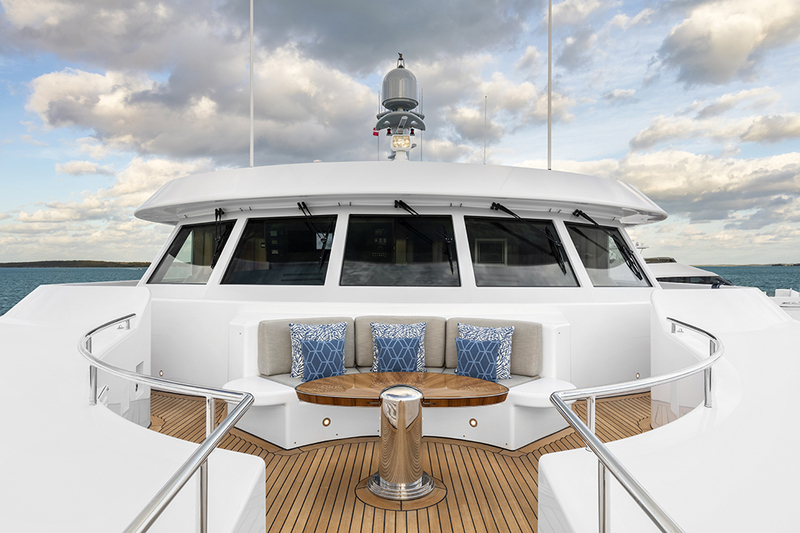 Her upper aft deck features an alfresco dining option, seating, and service area, making it ideal for any occasion, whether it be casual or formal. 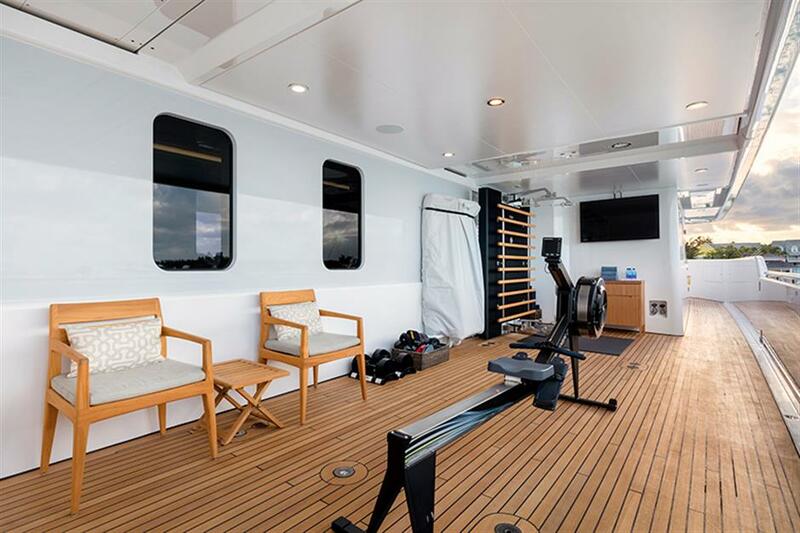 Forward of the bridge is a Portuguese deck, while the starboard side deck offers a shaded gym area. 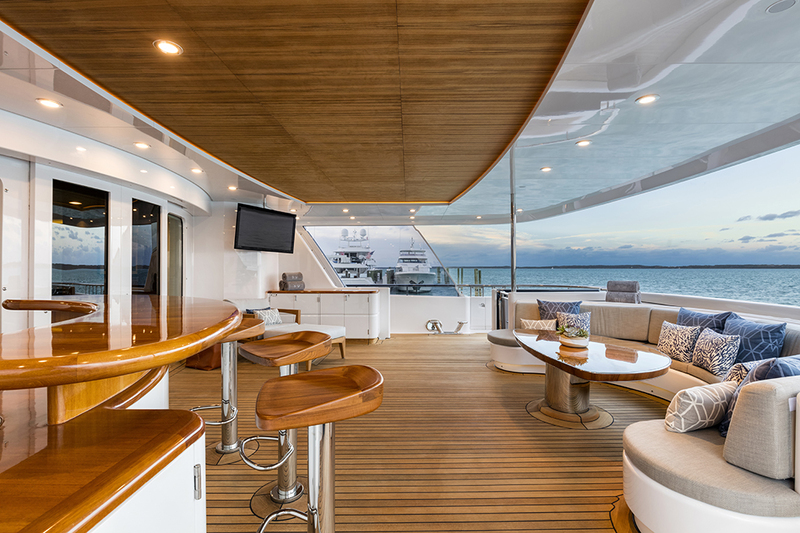 The sundeck is a social hub and boasts ample seating, a casual alfresco dining area, wet bar, sun pads and Jacuzzi tub. 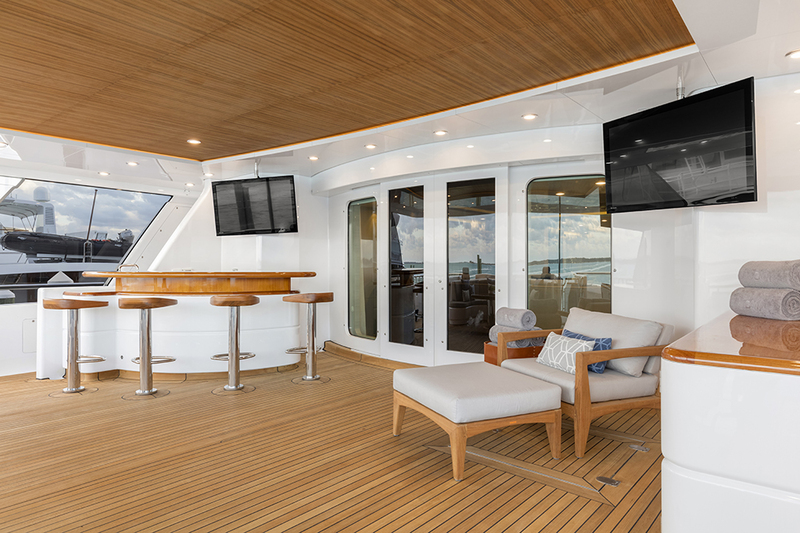 All decks are accessible from the interior and the exterior. 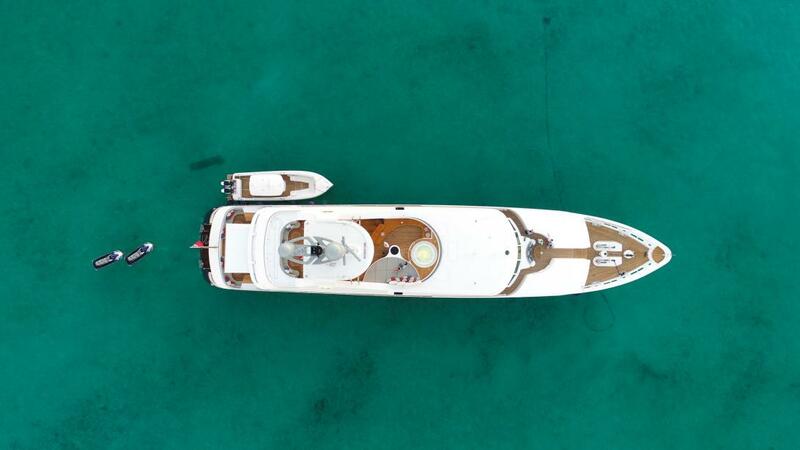 BROADWATER is powered by twin CAT 750hp engines with cruising speeds of 14 knots and top speeds of 16.5 knots. 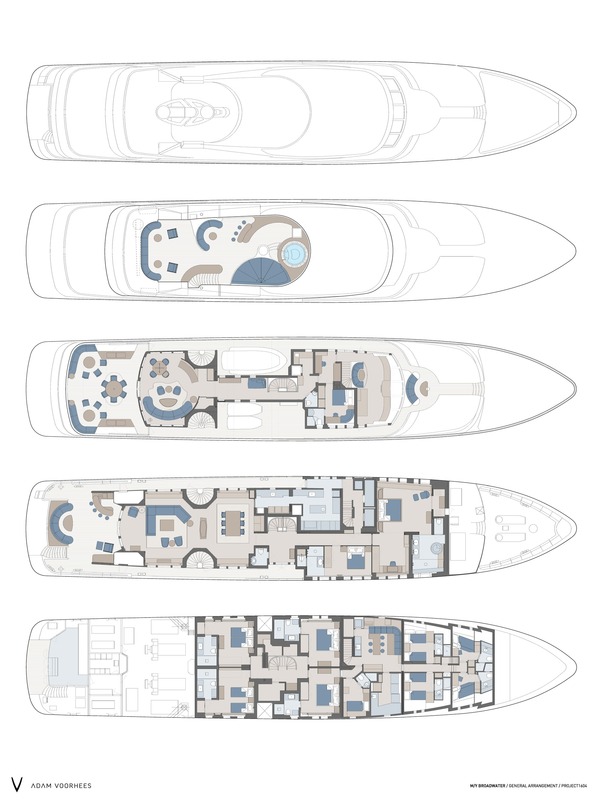 Her hull is displacement hull and constructed of aluminum. 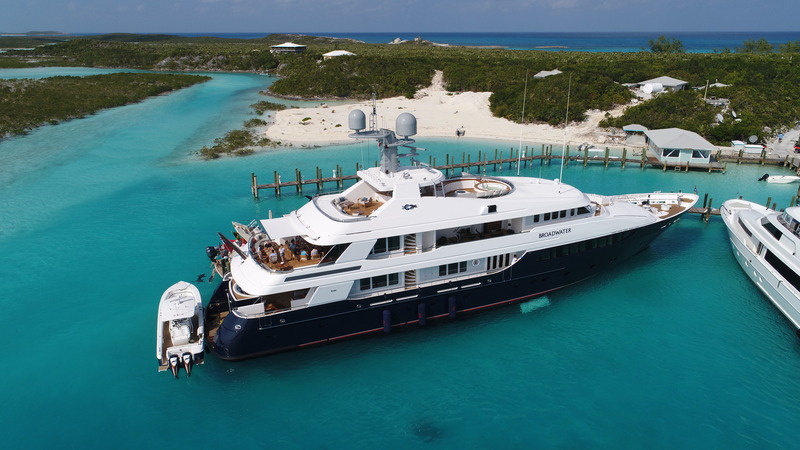 She is fitted with at anchor and underway stabilizers, for optimum comfort. 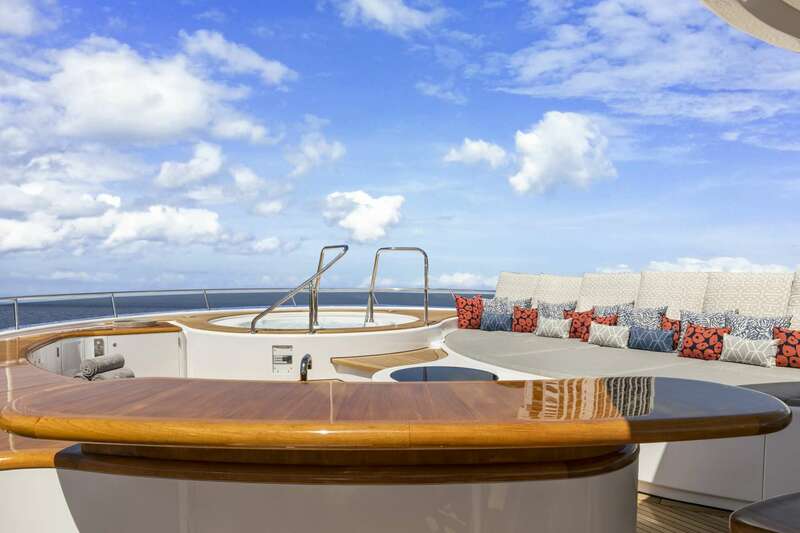 Accommodation is in 6 beautifully finished cabins, for up to 12 charter guests. 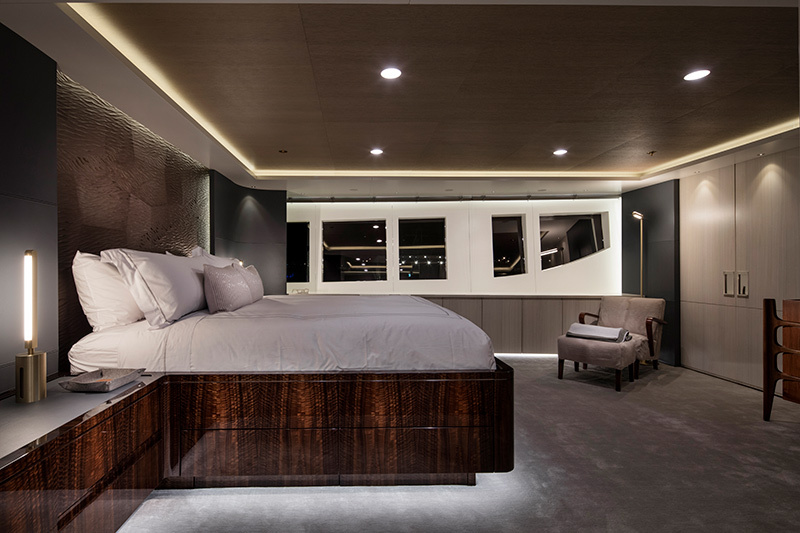 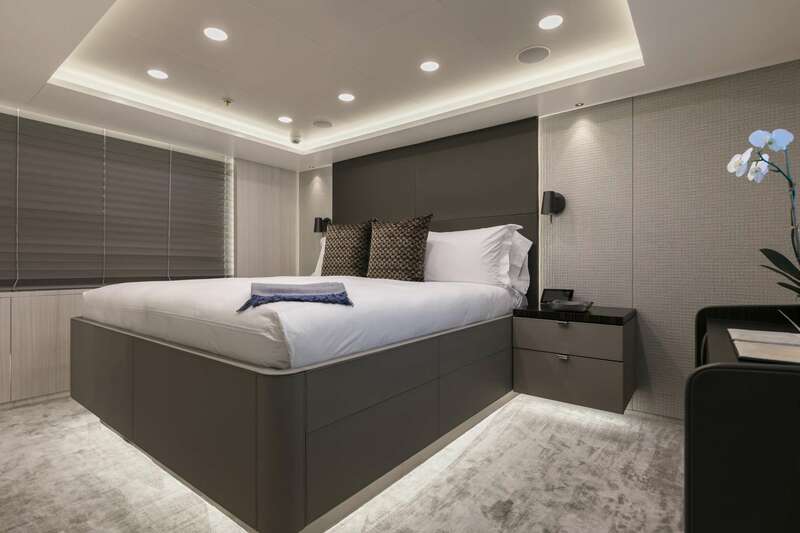 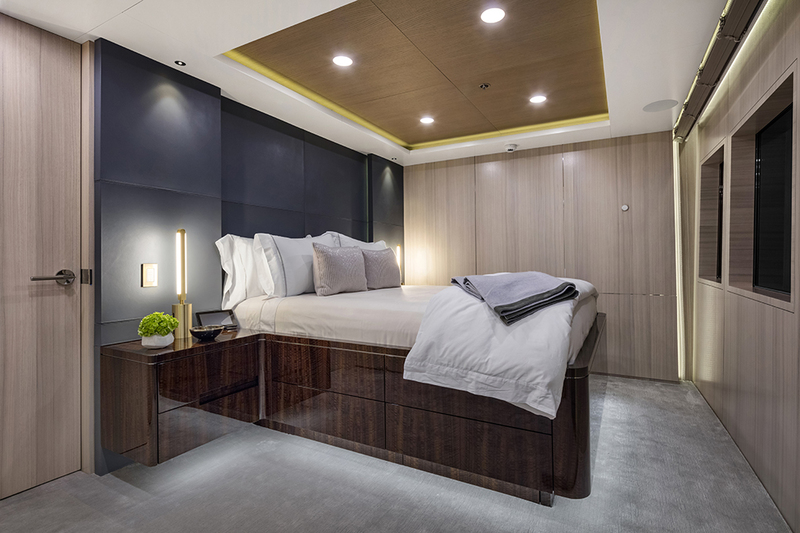 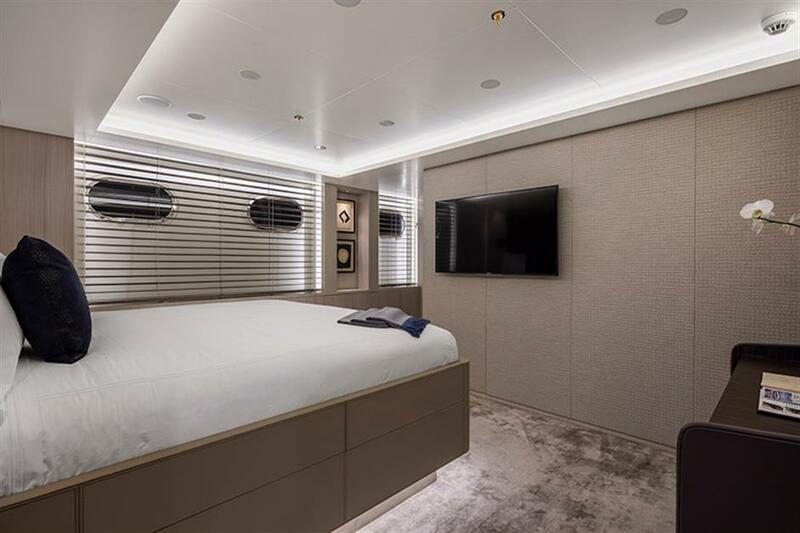 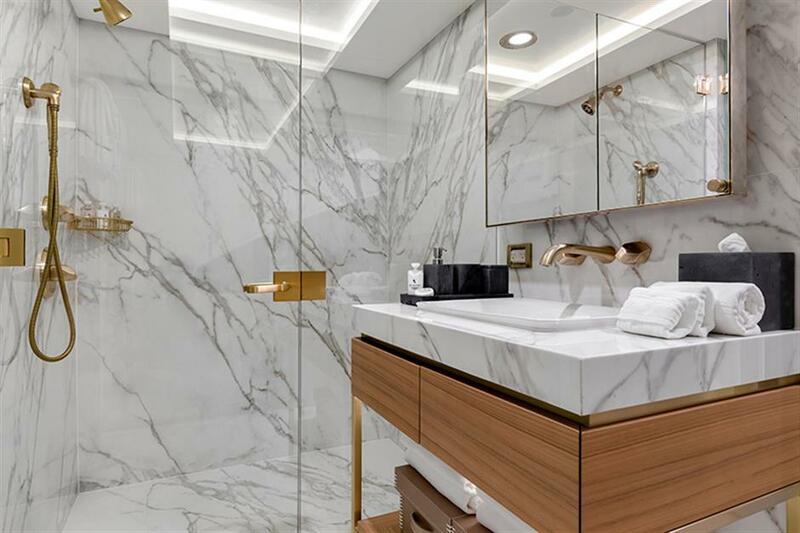 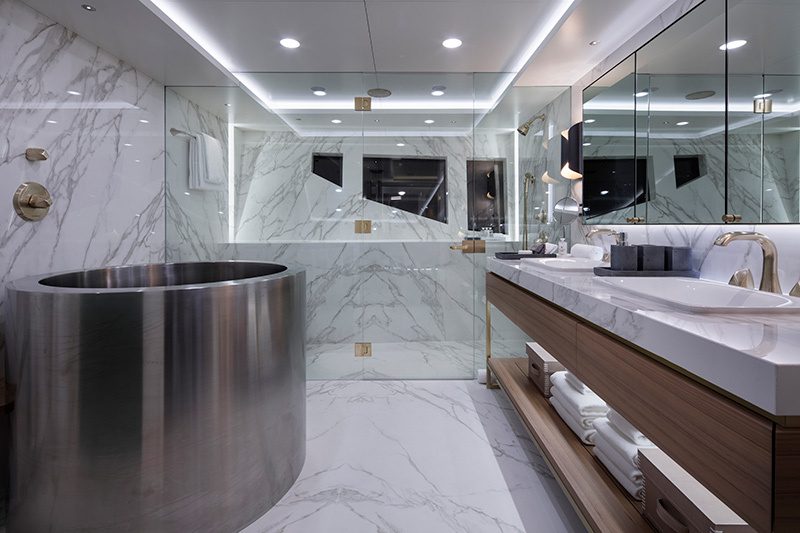 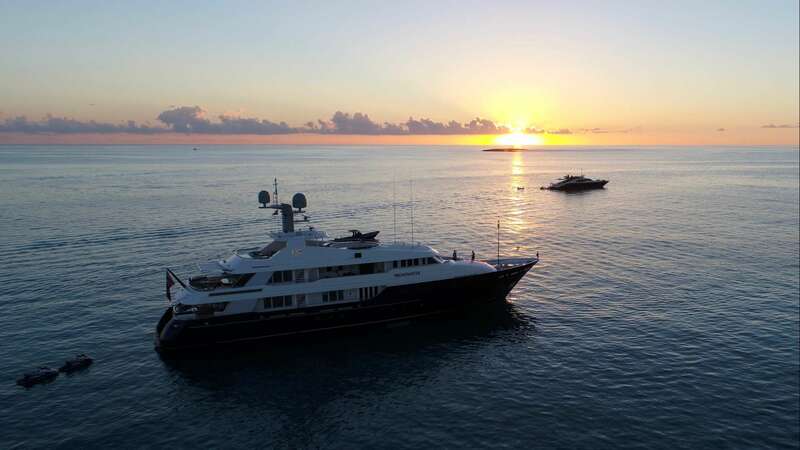 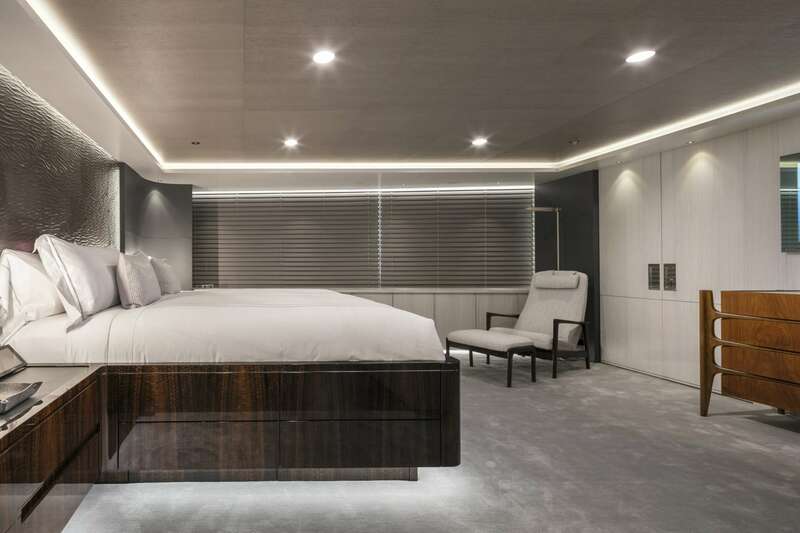 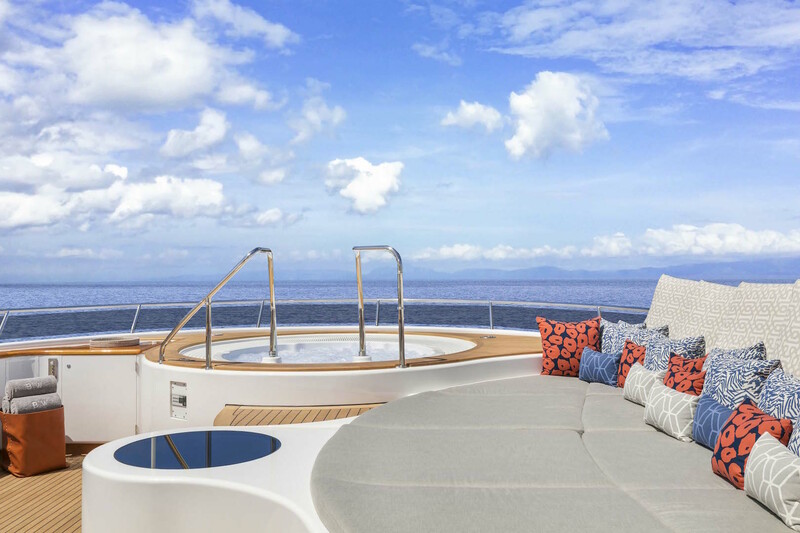 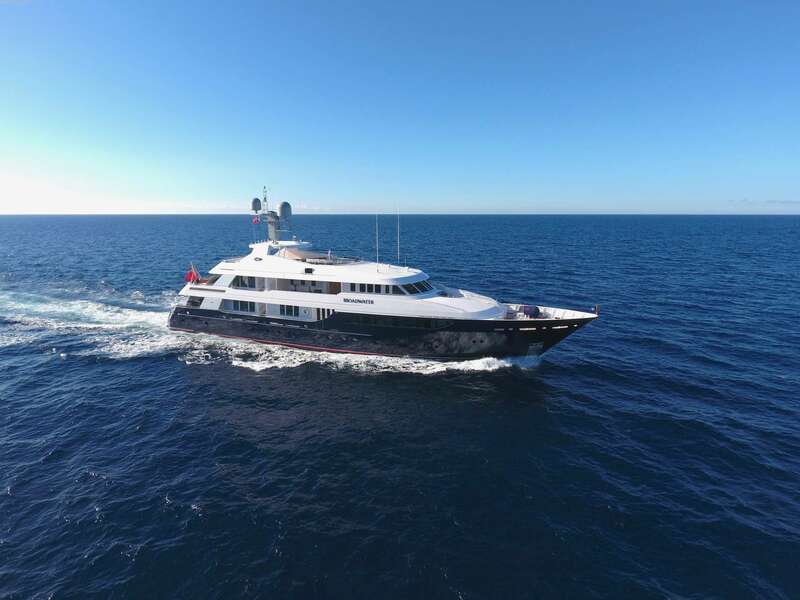 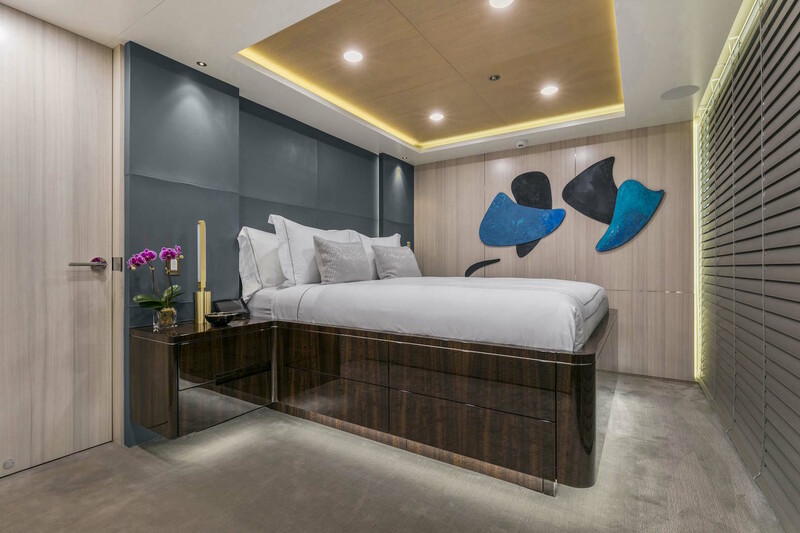 The master stateroom is on the main deck forward and full beam of the yacht, with a king size bed, seating area, private study and large marble ensuite. 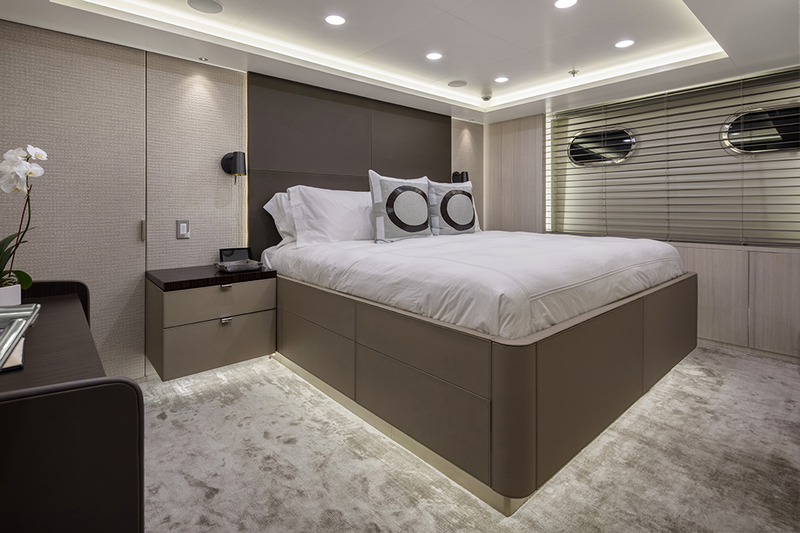 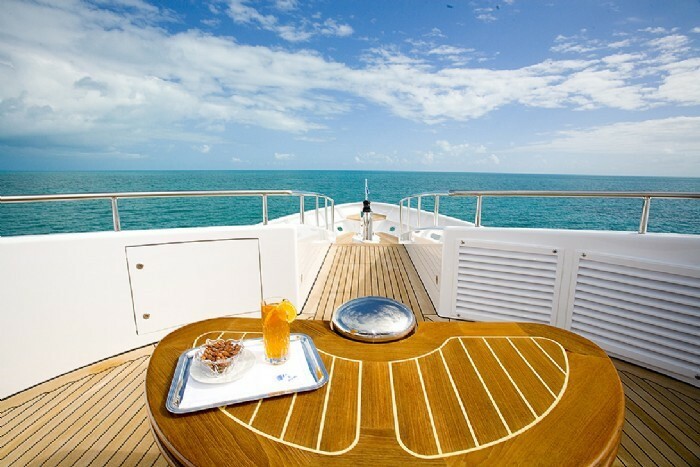 On the main deck, aft of the master cabin is the VIP cabin with a walk around queen size bed. 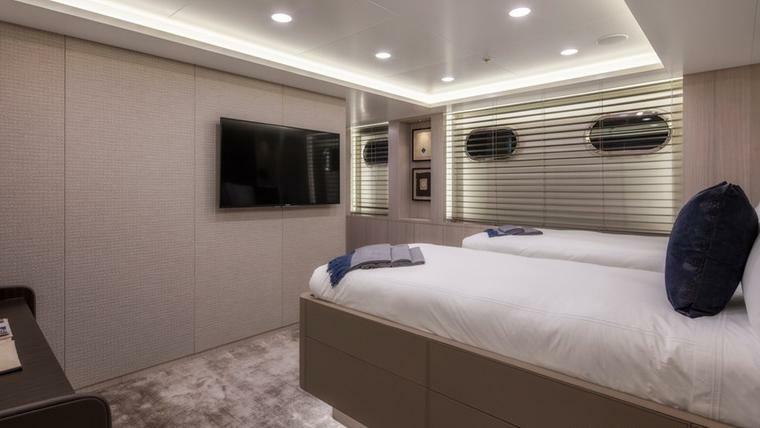 Below decks are 4 further cabins, each with king size beds. 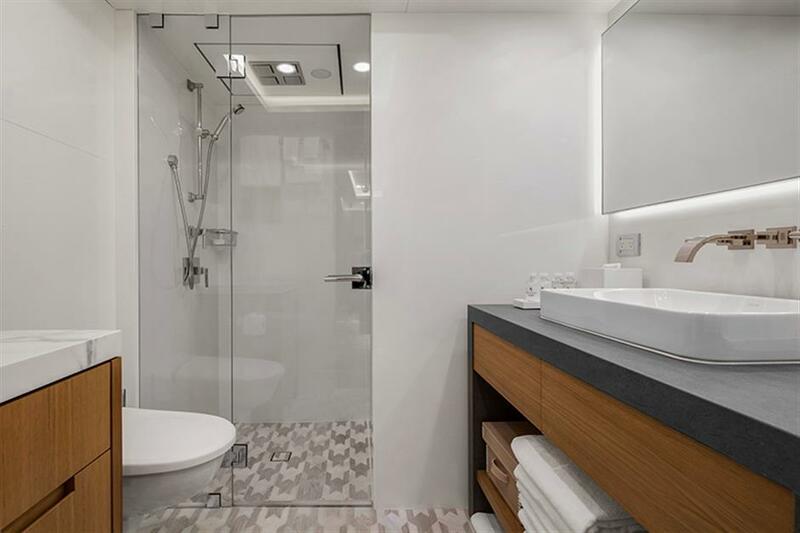 Two of the lower deck cabins can convert into twin cabins and include an additional Pullman berth. 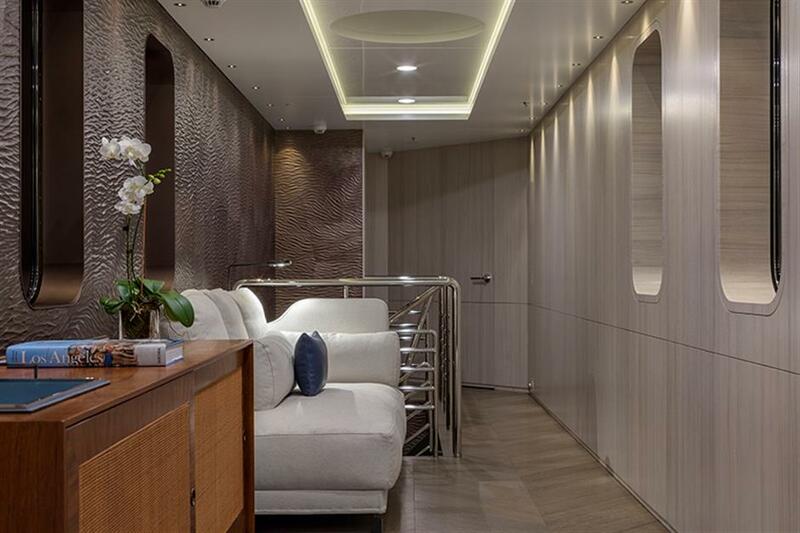 Each cabin has been exquisitely styled to reflect a soothing and relaxed ambiance.